View More In Drain Openers. 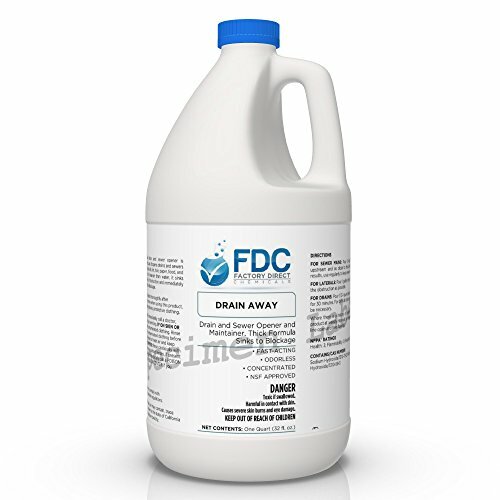 Drain Away is odorless, liquid drain and sewer opener dissolves and liquefies fats, oils, hair and other organic matter to keep them open and free flowing. Its powerful formula is heavier than water, so it sinks quickly to the point of obstruction and immediately starts to penetrate and dissolve the blockage. Plus, it can be used as a drain maintainer since regular use at weekly intervals can keep problem drains free of blockages. For Drains: Pour ½ to 1 quart into drain. Authorization NSF L1: Compounds for use in sewer or drain. If you have any questions about this product by EcoClean Solutions, contact us by completing and submitting the form below. If you are looking for a specif part number, please include it with your message.